Each month, as many readers will know, I’m involved in a Christian youth event called Powerpoint Edinburgh at St Thomas’s, Glasgow Road. The event is great and each month appears to grow bigger and bigger, attracting more than 250 young people a month; I seem to recall that last month there were around 400 crammed into St Thomas’s church building. 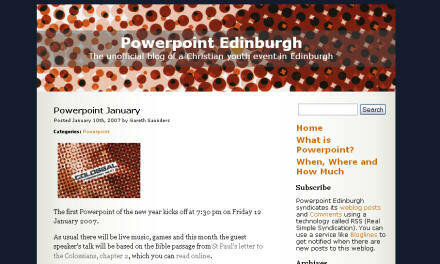 What has frustrated me, however, is that there isn’t a Powerpoint Edinburgh website. Not even a single page that tells folks when and where the event is. 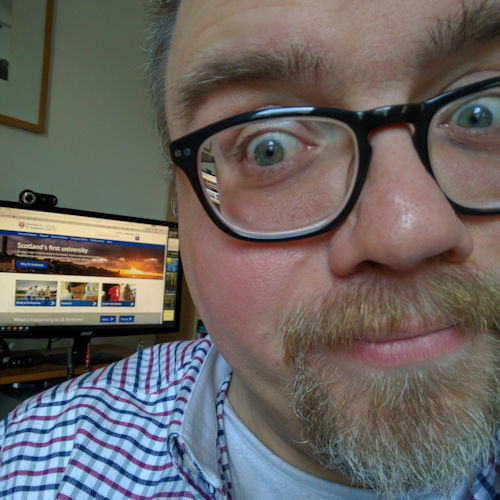 Well, when I say that there isn’t a Powerpoint Edinburgh website what I really mean is that there isn’t an official Powerpoint Edinburgh website. They do have a domain (www.powerpointedinburgh.co.uk) which is printed on all the flyers. But, well click it, there’s no site there yet. So, deciding that enough was enough my friend Mike (who plays bass guitar in the worship band) and I today set up a new WordPress.com blog and created our own little (and unofficial) Powerpoint Edinburgh (http://powerpointedinburgh.wordpress.com) blog site — a fan site, if you will — to post some basic information, links and a few pics to. Which is one of the beauties of the internet: if you spot a gap in the information available on the Web you can plug that hole yourself, very quickly. It took us about 2 minutes to set up the account, about 30 minutes to customize it, and a further 30 minutes to write the content. Which makes me wonder: if it was so quick to do why is there still not an official site? We simply hope that this wee site can plug a currently present gap until the real site launches.